Burberry. The 154 year old British brand. 1856: 21 year old Thomas Burberry, from Basingstoke, Hampshire opened his first store, originally specifying in outdoor clothing. The next fourteen years would see Burberry become a well established store. 1888: Gabardine; a waterproof, breathable fabric invented by Burberry himself was introduced to the brand. 1891: The business opened a new store (under the name Thomas Burberry & Sons) in Haymarket, London. This site remained its headquarters until 2008 when it moved to Westminster. 1901: The Burberry Equestrian Knight Logo was introduced including the Latin word ‘Prorsum’, meaning forwards. The logo became its trademark and is still used today. 1914: The War Office asked Burberry to develop their officer’s coat to suit their requirements. Following this, the trench coat became increasingly popular. 1920: A second trademark for Burberry was introduced. The famous Burberry check began as the lining to their trench coats. The trademark would later be used on its own for several other Burberry products. 1955: Burberry was awarded a Royal Warrant by HM Queen Elizabeth II. A second warrant was granted in 1989 by HRH Prince of Wales. 1967: By now, the Burberry Check was now used for a variety of accessories including; scarves, luggage and fragrances. Burberry’s popularity grew during this time, seeing many celebrities wearing the brand. 1980/1990s: During the 1980s, the brand expanded further, introducing more products to it’s line. In the 1990s, Burberry’s profit grew with the help of American CEO Rose Marie Bravo, who re-established the brand after a fall in sales. 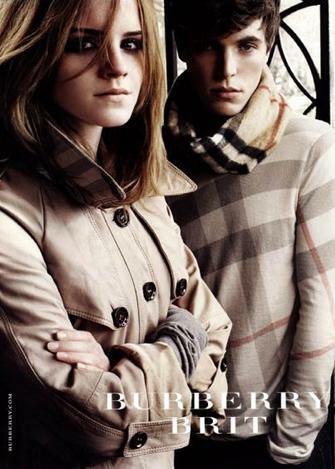 2000s: Following its increase in popularity; Burberry saw a massive increase in sales. In 2001, Bravo hired Christopher Bailey, a designer who was at the time working for Gucci. Burberry added multiple new products to their range; including perfumes, which increased profits over the coming years. Today: Burberry states that it is “an internationally recognised luxury brand with a worldwide distribution network.” The company recently revealed a 21% rise in its sales in the last six months. Campaigns: Burberry has been well known for its high profile campaigns over the last decade. Starting with Kate Moss, Burberry has seen several well known celebrities and models front their campaigns including; Rachel Weiz, Agyness Deyn and most recently, Emma Watson. Burberry’s Image: In recent years, Burberry’s image has been distorted due to the brand’s famous Burberry Check being copied. The check pattern became widely associated with “chav” culture; with the pattern being copied and used for various clothes items that were not from Burberry itself. Although Burberry became so associated with the “chav” image; it did not thwart the brand’s image for long.